During this season of Lent, our family has been practicing confession of our sins, our shortcomings and frailties at the dinner table. 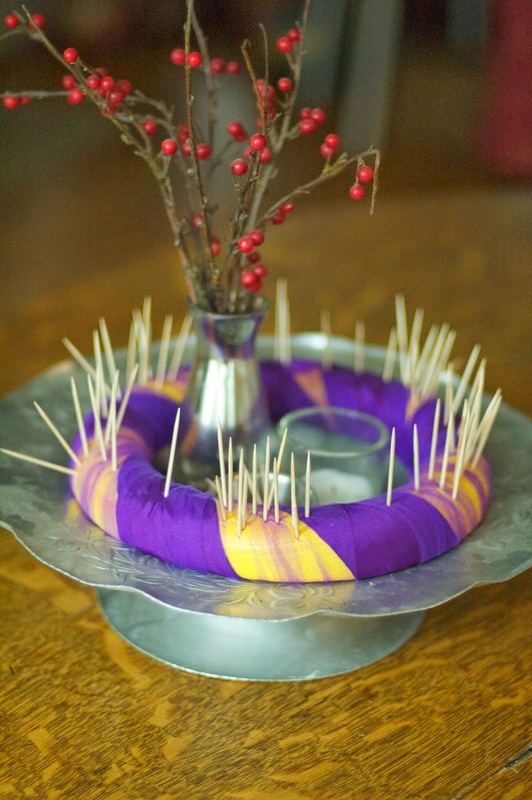 We have this wreath in the center of our table with a little dish of toothpicks. We stick a “thorn in the crown” representing our sin. We have done this during this pre-Easter season for the past few years. It is so convicting and powerful. [If you don’t know of this ritual and want to know more (and the beautiful conclusion)- read about it HERE]. My kids have really engaged with this practice. They quickly grab for the toothpicks, ready to confess. They are aware of their struggles and the ways they have lived out of a selfish place. This humility and self awareness seems so important. (We have had a lot to confess lately- as we’ve had some rough days). It has been a beautiful and convicting experience to have my children model conviction for me. One of the most humbling parts of it this year has been the repetition of sin in my days. As I ponder the day’s words, thoughts and deeds, I find that I repeat the same sins over and over. The other day, I followed my kids’ lead by grabbing a toothpick. And then I just held onto it. My daughter asked, “Are you going to share your sin?” I said, “I’m thinking.” She replied with some suggestions of sins from my previous week, (thank you very much) “What about self pity, judging, impatience?” Yep. Those are the ones. The ones that keep surfacing. While I’m confessing, here’s another. (Not nearly as ugly.) I am tired of dinner. I am tired of dinner planning, of preparation, of dinner itself. I wish that we could just make a peanut butter and banana sandwich, or have a salad, or open a can of tuna, or take some “dinner pill” and call it a night. But I have people in my house that like a real meal for dinner. Sigh. I am grateful for the longer days of sunshine, as it helps with my motivation. My friend Lindsey was telling me this week that last month she planned out the entire month of dinners for her household. I’m so impressed. She said she went ahead and bought all of the non-perishables for the month and then bought perishables each week. I think this is brilliant (and ambitious) and I’m hoping that maybe she will just give me her month-of-menus and I won’t even have to think! We like the same kinds of meals, so I would be happy to adopt her plans. If my daughters had it their way they would choose pasta every meal. I really try to limit it to one dinner a week. I felt like I needed to add another pasta dish to my repertoire. I was trying to think of something easy but different and delicious to make. I didn’t want to do a meaty lasagna- for the sake of cost and trouble and my meat-adverse people. My family loves ravioli. 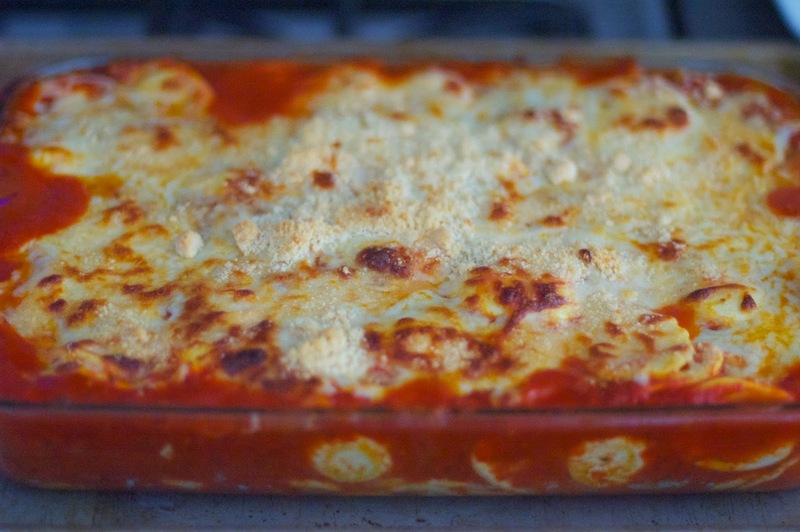 I found a recipe from Martha Stewart’s EVERYDAY FOOD for Baked Ravioli. 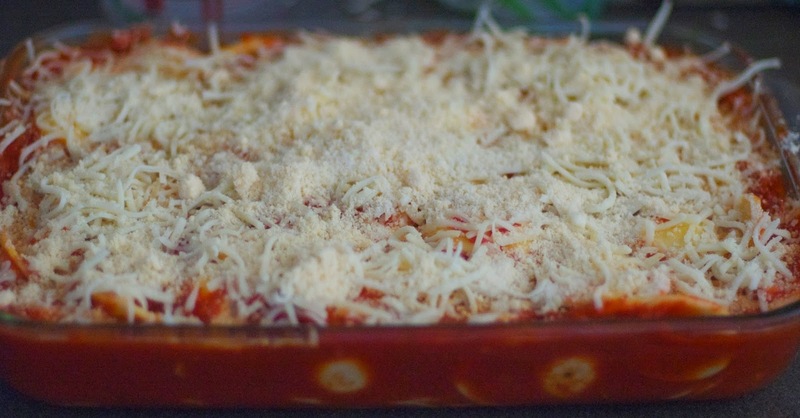 It is so simple and is lasagna-like in that it has the pasta, cheesy and savory filled, with red sauce in between, but much less work. I followed her recipe, and even made the sauce she instructed to make. It was so delicious. I think next time, I confess, I might just make it with jars of good quality pasta sauce. The homemade sauce didn’t make that much of an impact. Then the recipe would be even simpler!! I also think I’ll attempt to sauté some vegetables to layer into the dish- maybe zucchini and squash to incorporate some healthiness. 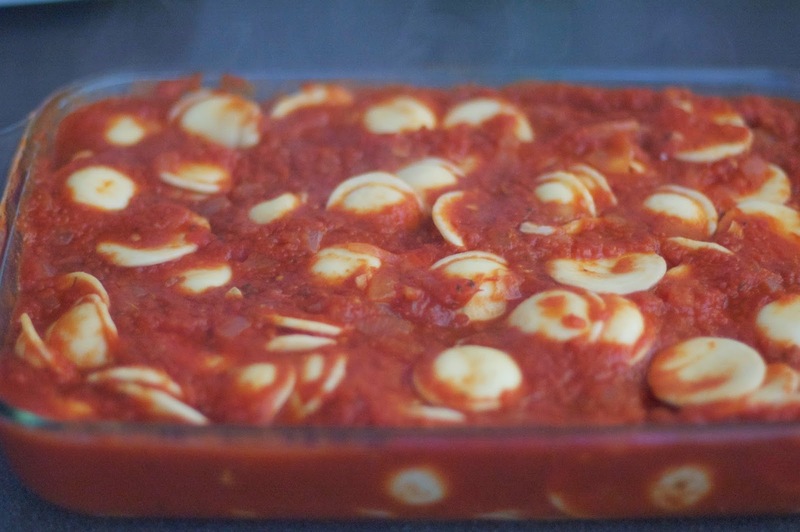 And, if you are making for a smaller crowd, you could make it with one bag of ravioli and one jar of sauce and make it in a square baking dish. Preheat oven to 425˚ degrees. Heat oil in a large saucepan over medium heat. 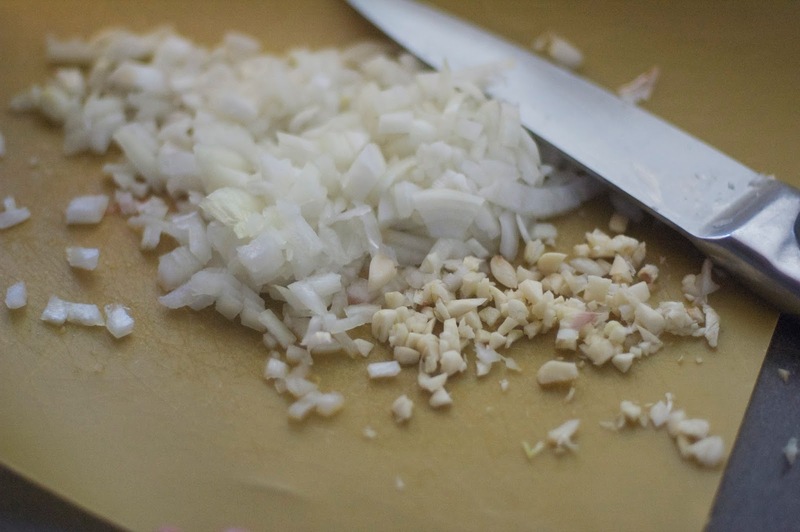 Add onion and garlic, and season with salt and pepper; cook, stirring occasionally, until softened, about 5 minutes. Add spices. 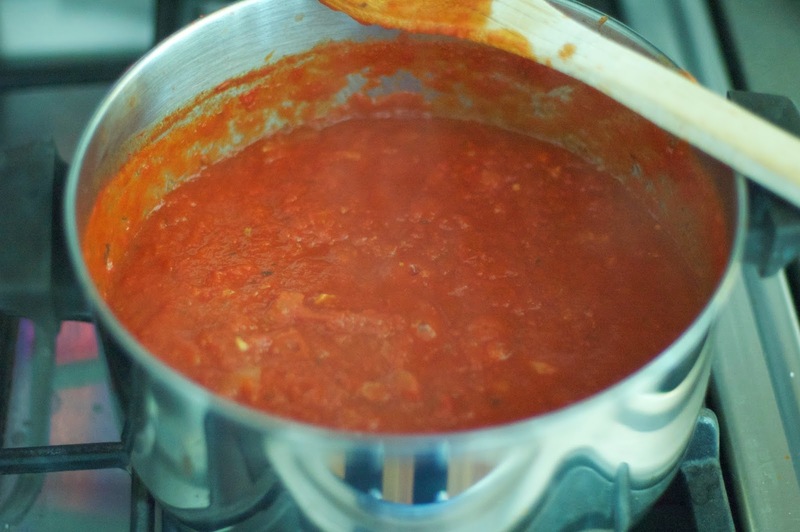 Bring to a boil, reduce heat and simmer, breaking up tomatoes with a spoon, until sauce is thickened and reduced (about 20-25 minutes). OR heat up 2 jars of quality pasta sauce. 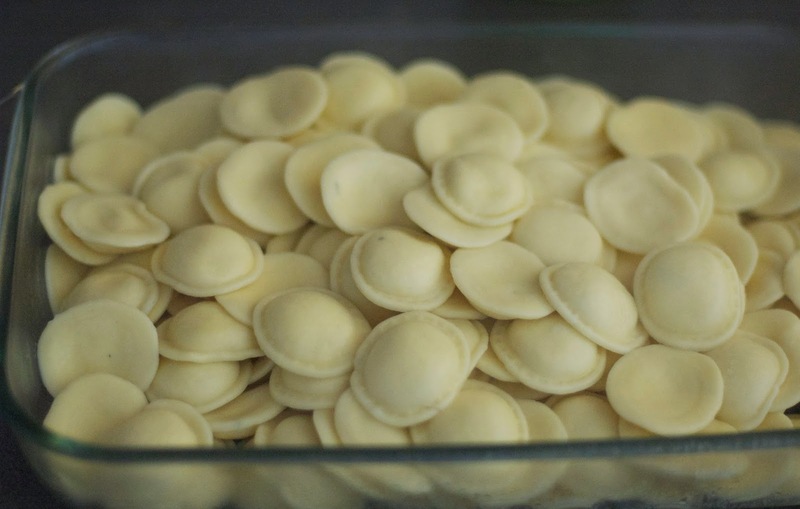 Meanwhile, cook ravioli in a large pot of boiling water, salted. 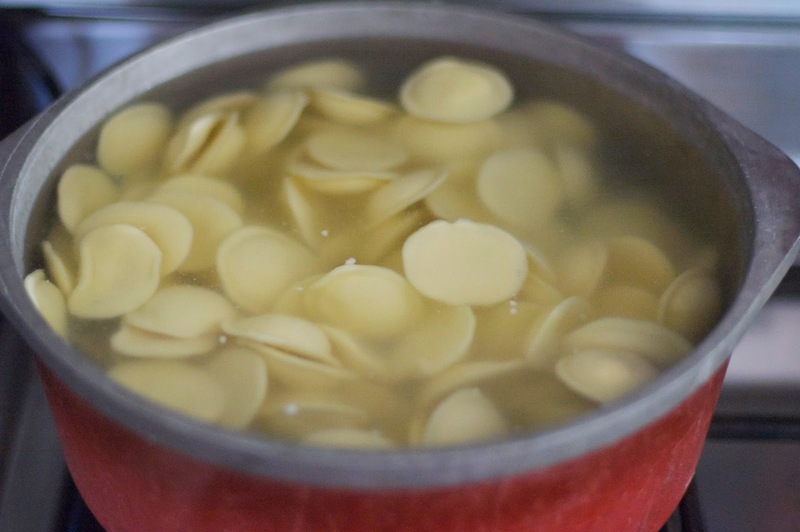 Cook for just a few minutes- until pasta rises to the top of the pot. Drain pasta. Toss sauce with pasta. Pour into a large baking dish (13 X 9). Sprinkle with mozzarella and parmesan cheeses. Bake for 20 minutes or until golden on top and bubbly. Cool slightly before serving. I hope you are having a lovely beginning of spring, a meaningful season of Lent (if this is something you practice), and inspired dinners! so what is your favorite brand of pasta sauce? Great question. I have a few, depending on availability. If you have a Trader Joe's (and I hope you do), their sauces are great. We love the marinara in the can with the colorful label. Also, a friend introduced us to VICTORIA sauce – it is authentic Italian sauce from New York. Her family used to get the sauce when they lived in N.Y. and then Walmart (of all places) began to distribute it. It is so good. She introduced it to us and we are fans. I have tried a few of their varieties and they are all really good. However, if you don't have either of these available, I think you can't go wrong with Classico from the grocery shelf. It is quality, affordable and delicious! I have a friend that introduced me to this, but with the flat square ravioli, and you layer them just like lasagna (though still way easier than lasagna, because you have no added ricotta or anything) and it was a super tasty way to layer in lots of extra veggies in and do fancier things in the in between layers, since i was putting very little effort into the pasta side of things. AND it looked really pretty. and now i want it for dinner tomorrow. shucks. P.S. your lenten tradition is one of my absolute favorites, and year after year it inspires me. i've said it before and i'll say it again…..adopt me. Amy, yes please, may we adopt you? We would all be richer for it at our home! I can't wait for you to be back in Nashville!